The Daily Regret – Hell, Inc. The Daily Regret sounds like a very depressed newspaper. I have returned from Auroracon in High Level, which was an incredible experience that has left me utterly exhausted. I had planned to get some work done on Sunday night after getting home, but instead I fell asleep on the couch after dinner. For 7 hours. Next weekend is the AALT conference in Drumhellar, then I have a weekend off… to move into my new place. BRB dying. How is an entire business the Employee of the Week? Shut up, that’s how. Thanks to Happy Harbor Comics for their patronage, as well as the fact that they carry all of my books and bring me to book fairs at schools and libraries across Alberta! Next Week: The Intern. 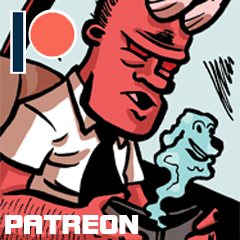 Read it early by becoming supporting Hell, Inc. on Patreon!